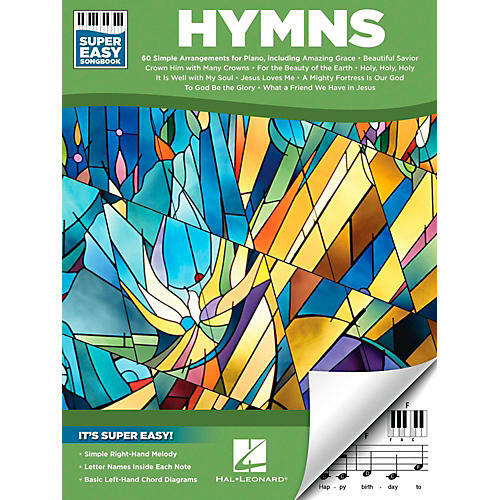 Easy arrangements of popular hymns. This series features accessible arrangements for piano, with simple right-hand melody, letter names inside each note, and basic left-hand chord diagrams. This edition includes 60 hymns: All Creatures of Our God and King • Amazing Grace • Be Thou My Vision • Beautiful Savior • The Church's One Foundation • Crown Him with Many Crowns • For the Beauty of the Earth • I Love to Tell the Story • It Is Well with My Soul • Just As I Am • A Mighty Fortress Is Our God • Nearer, My God, to Thee • O Worship the King • Rock of Ages • 'Tis So Sweet to Trust in Jesus • We Gather Together • What a Friend We Have in Jesus • When I Survey the Wondrous Cross • and many more.